Los Angeles is a burger city, the birthplace of In-N-Out Burger and McDonald’s, along with classics like The Apple Pan, Bill’s Burgers, and Pie ‘n Burger -- but if you’re even a moderate burger fan, you already know about all of those. 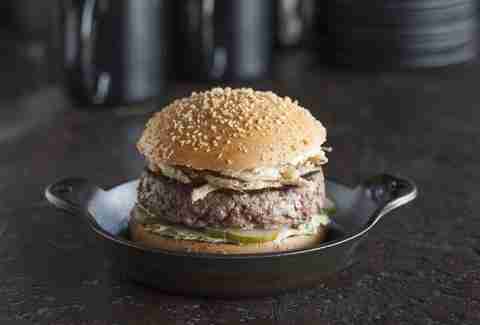 But do you know about these 12 totally secret, totally delicious off-menu burgers? No. You do not. Angie Corrente, Stan Mayzalis, and Chef Kristina Miksyte debuted Doma 2.0 in Manhattan Beach in 2015 and they quickly expanded focus from Uzbek and Eastern European specialties. 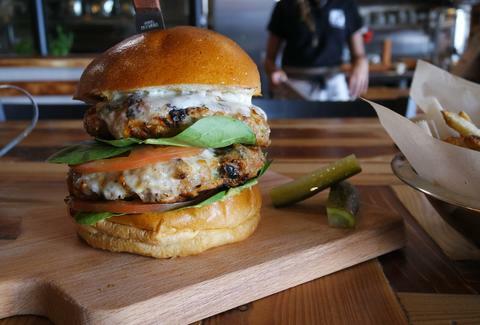 The off-menu Russian-spiced double chicken burger is quite a departure from their somewhat exotic menu, and features two grilled chicken patties, Provolone cheese, guacamole, tomato, and lettuce on a brioche bun. Whisper your order for the Haus burger “Old Town Dog" style, and this mini-chain will deliver a double patty topped with smoked bacon, caramelized onions, roasted jalapeños, chipotle aioli, and cotija cheese. 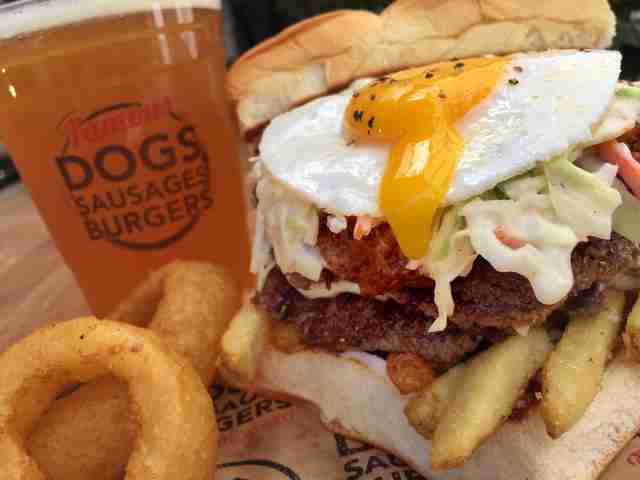 They also have an off-menu Freiburger, topped with a double patty, chili, molten white American cheese, fried egg, Haus slaw, fries, and mayo. This comfort food spot may not have a burger on their lunch menu, but, uh, guess what, they actually do: griddled patties made with brisket, chuck, and short rib provide a canvas for caramelized onions, melted American cheese, Thousand Island dressing, and punchy pickled mustard seeds on a toasted brioche bun. Hey 19 is a retro Torrance gastropub from Demi Stevens that name checks a classic Steely Dan song. 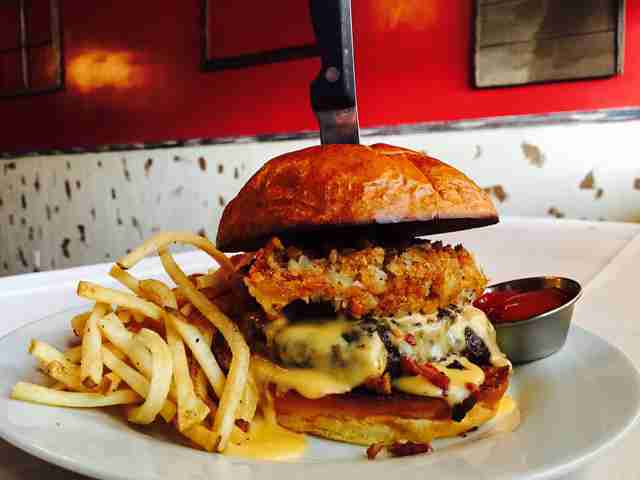 She and Executive Chef Vasili Tavernakis preach the gospel of organic and humane products, but they’re not above busting out a burger that honors Jeff Spicoli, Sean Penn’s burnout character from Fast Times at Ridgemont High. Each Spicoli burger features a tater tot waffle, mac & cheese sauce, and bacon bits. And, yes, a burger patty. Damn. Jar, the modern chophouse from Chef Suzanne Tracht and longtime culinary running mate Preech Narkthong, has become a mid-city mainstay since opening in 2001. It might take some convincing to skip their fork-tender pot roast, but the Jar burger is a seriously great off-menu alternative. 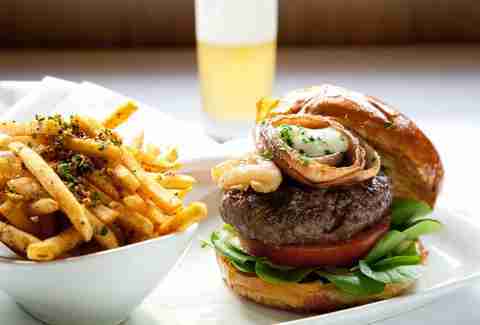 The burger features balsamic red onions, lettuce, tomato, and aioli on a brioche bun and comes with a side of signature Jar fries with garlic and parsley. They don’t always have it, but you gotta ask if they do -- this Thaitown staple (and favorite of Jonathan Gold) does their burger with fresh ground tri-tip, marinated, grilled, and plated on iceberg lettuce with tomatoes, basil, red onion, green Thai chiles, and secret sauce. Chef Josef Centeno concentrates his creativity in downtown’s Old Bank District, with Ledlow as his forum for nouveau retro American cooking. 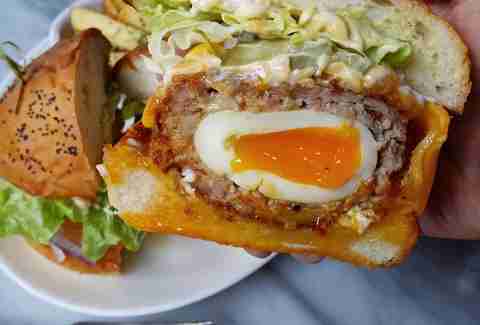 He’s managed to fuse two seemingly disparate comfort foods to great effect with his Scotch egg burger. Spicy house-made fennel pork sausage encases a gooey seven-minute egg. The round patty is panko-breaded and emerges crispy, but slice and you’ll still find a runny yolk. Each burger comes on a house poppy seed butter bun with Dijon mustard, garlic aioli, lettuce, pickles, and onions. 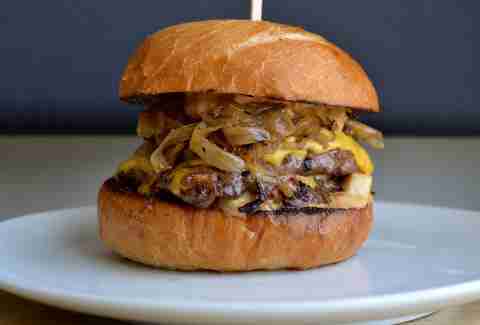 It took convincing from an insistent regular for Chef Michael Fiorelli to offer a burger at Mar’sel. He insisted that the customer keep the burger on the “downlow,” but of course the creation caught fire. 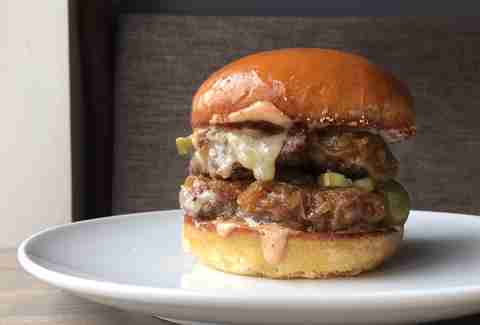 Now the same burger is available off-menu during dinner, and on the weekend brunch menu, at Love & Salt. Twin Wagyu patties host caramelized onions, tomato aioli, pickles, and Fontina on a buttered Larder Baking Co. brioche bun. Don’t just check the menu at this mainstay: they always also offer several beef-based, off-menu burgers. Their Cheeseburger Machismo might cause your mouth to ignite thanks to the habanero cheese, bacon, spicy mayo, jalapeño escabeche, and batter-fried onions. The Royal with Cheese would no doubt impress Vincent Vega and Jules Winnfield with the additions of braised short rib, truffle cheese, truffle aioli, sweet onion rings, and red wine reduction. Two burgers honor local sports heroes. The Tommy Lasorda Burger includes a butterflied hot dog, raw onions, tomatoes, lettuce, Americanized dashi cheese, mustard, and bacon spread. And the Lakers Pride Burger features a pair of 3oz patties, pig candy, habanero mayo, a red wine reduction, and cheese that proudly displays Lakers colors -- yellow Americanized dashi cheese and purple Port-infused Gruyere & Parmesan. 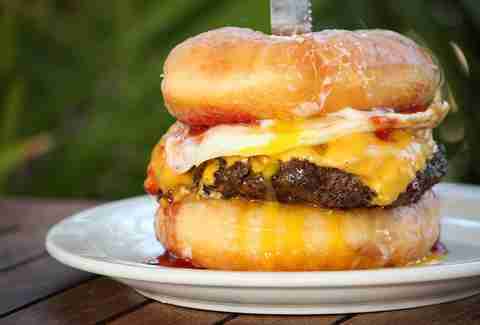 During football season, when Slater’s 50/50 opens early for breakfast, founder and “baron of bacon” Scott Slater offers an off-menu donut burger. 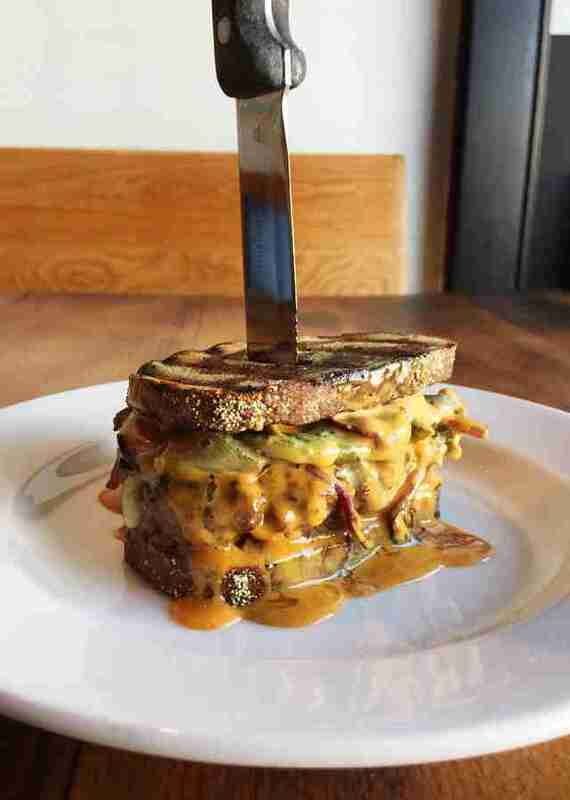 This sweet and savory behemoth features Slater’s signature 50/50 blend of beef and bacon. American cheese, a sunny-side-up egg, and strawberry jelly join the party between a pair of glazed donuts sourced from Ca’ d’Oro Bakery. Joshua Lurie is the LA-based founder of Food GPS, a website that showcases the best tasting food and drink in California. Follow him on Instagram and Twitter.